What Does Jesse Pruitt Have to Do With This? Here is a screen capture of the filing history as of today, April 22 2009. 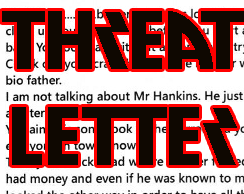 Note that anyone can go up and look at the documents that Mike Ford had filed as well as new changes. We looked today, April 22 2009 and saw that the name of the registered agent, as of April 2 2009 is now Monica Sheldon. 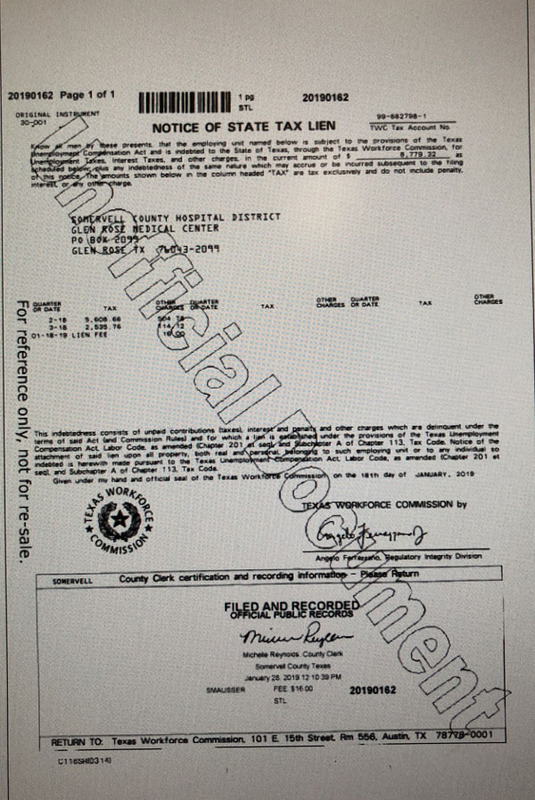 The document for Statement of Change for Registered Office/Agent was dated 3/21/2009 and was signed by Jesse Pruitt and faxed from his real estate office at CMC Commercial Realty, with date to become effective when filed, that is April 2 2009. Apparently there was a spelling/typo or other error made by Mr Pruitt because he sent in a Certificate of Correction (oops, signed it 2010 instead of 2009). But when I look at the list of people on the board, Jesse Pruitt's name is not on it, nor has it ever been. What does Jesse Pruitt have to do with the Roger E Marks Foundation when his name is not publicly associated on the SOS website? 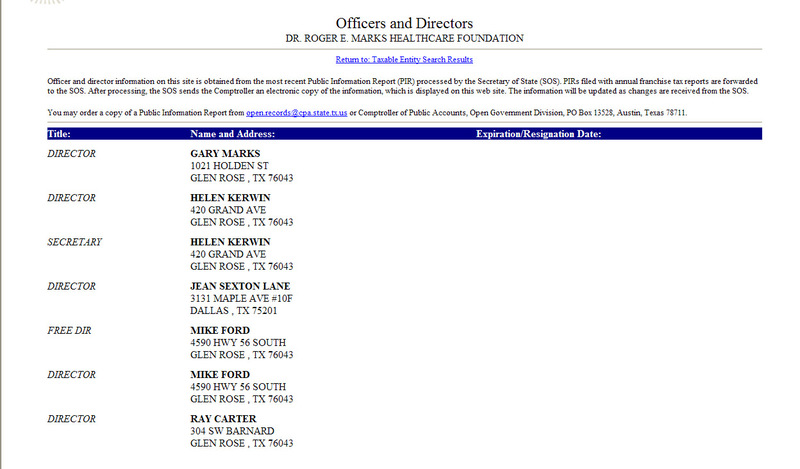 This is a screen dump of the management list for Roger E Marks as taken today. Even if, tomorrow, the board of directors were to be updated, Jesse K Pruitt's name appears nowhere in association with it. We do have to wonder, if a person isn't listed as being on the board of directors or management but is able to sign these types of papers, what prevents ANYONE from sending in a paper and saying that he or she is the legitimate person to act as a representative? In other words, can just anyone turn in forms regarding foundations or corporations without being legally a representative in the eyes of Texas? If so, I suppose I could just up and turn in a form and change the address to, um, say MY address for people to send their donations to. Right? 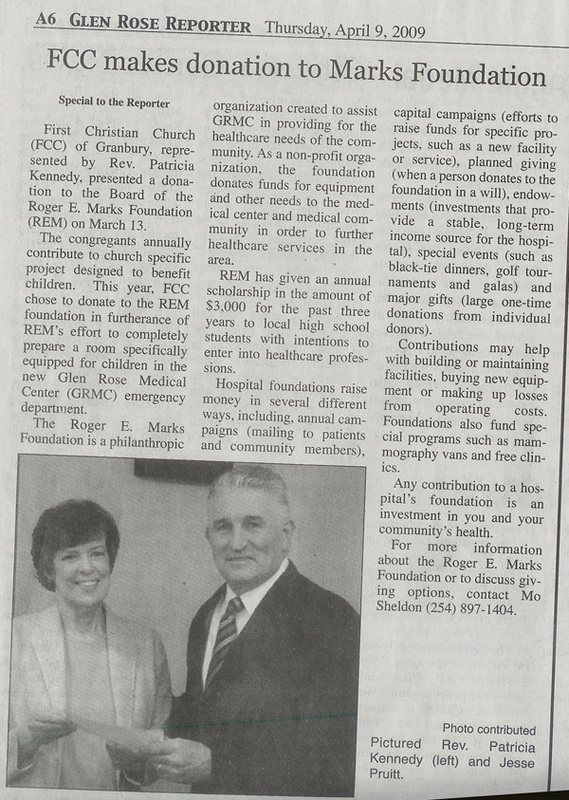 Here was an article from the Glen Rose Reporter of April 9, 2009 that had, first paragraph, the sentence "First Christian Church of Granbury .. presented a donation to the Board of the Roger E Marks Foundation (REM) on March 13" along with a photo. Since Mr Pruitt is who appears in the photo. wouldn't one logically assume he is on the board or otherwise associated with the REM foundation? Here's a link to the SOS website's forms. I notice that there is a "Statement of Resignation of Registered Agent" form. Seems like Mr. Ford would have had to fill this out, right? He told us that he just sort of quit one day, but had no paper trail, didn't present any resignation before the board he was executive director of and couldn't remember when it was. Before one gets a new registered agent, shouldn't the old one have to resign.. formally? It's interesting to note that in the Change of Registered Office/Agent instructions, Section 5.202 says "Since an entity may be terminated or its registration revoked for failure to maintain a registered office and agent, any change should be submitted promptly." And yet, Mr. Ford would have us believe that despite creating it, setting it up, changing the address on it, filing tax returns for it, etc, he just sort of up and quit at some point, even though the Roger E Marks foundation could have been terminated for his supposed negligence. I also notice in the Change of Registered Agent and/or registered office form that the person signing the form has to be "a person authorized by the BOC to act on behalf of the entity in regard to the filing instrument. Generally, a governing person or managerial official of the entity signs a filing instrument". But my question is, how would the SOS know that if the name is not associated with an entity? Or is there someplace else that such information is filed so that any member of the public could know those that represent a foundation? A very good question for the SOS. Update: I have called twice more to the SOS office and got two different answers, as of today May 13 2009. One person told me that the entities have to update their status as of every 4 years, the second person told me that that used to be the case but the law has changed. 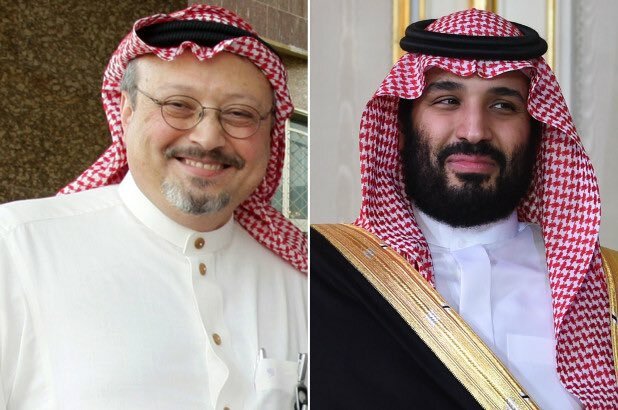 Either way, seems to me that the Roger E Marks foundation would want to make sure, paricularly since they are soliciting and accepting monies, that the official websites can corroborate the board members. And again, any person happening by that wants to corroborate that the person who prominently appears in the paper taking money is actually considered, in Texas, as a listed board member, cannot do that. 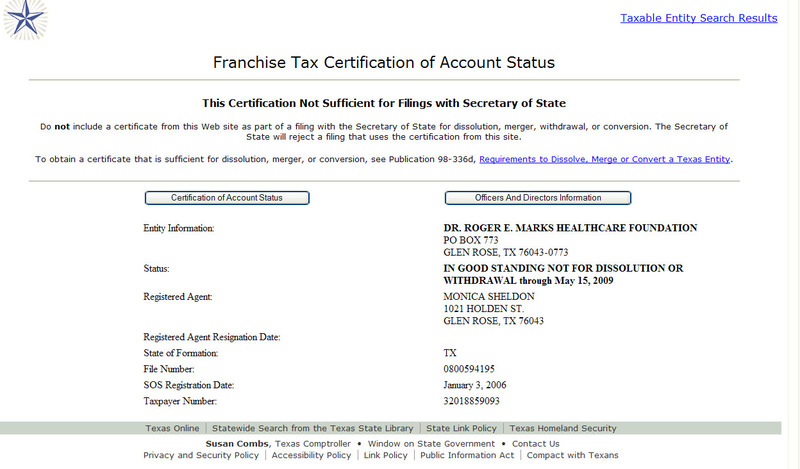 I was told also that the franchise tax information has to be returned by May 15 and will definitely be updated on the cpa.state.tx.us website by mid-jUne at which point the actual form is available through open records. Right now, the latest form filed was by Mike Ford on December 31, 2007. Here's a screen dump of the franchise info as of today, May 13 2009. You will notice that while, 2 months ago, Mr Pruitt filed papers to finally change Mike Ford from being registered agent, with Mike Ford's home address, to Maurice Sheldon with an address of the GRMC. 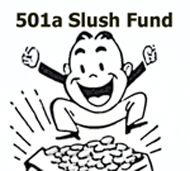 But there were no papers filed to update Mr Pruitt himself to indicate he is a board member, although he has been soliciting funds since at least the end of 2008. 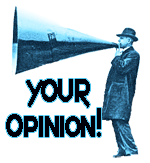 I believe that, particularly when an entity is soliciting money or bequests from people it's, at best, sloppy not to have all public references updated and available for verification, particularly when it's clear that time was taken to update SOME aspects of legal responsibility.